The Hamlet Special Edition comic flip-book was a very late development in the The Billionth Monkey’s production. Imagining all the tie-in websites (as discussed in this blog), I wanted to have a Hamlet Special Edition comic book cover over at Stanley’s Marvelous Comics. In speaking to a few artists about this idea, I found myself saying, “This art won’t appear in the actual book. It will be used on a website that only some readers will discover.” Eventually I started asking myself, “Why shouldn’t it appear?” That was when I imagined putting a fake back cover on the book. Alas, I couldn’t do that without some content to go with it…and so what started as an afterthought became a major part of creating The Billionth Monkey. I decided to take Act I, Scene I, of Hamlet and script it as a bronze-age comic book with George Lucas-like additions of extra stuff to the backgrounds. Although this was parody, my intellectual property lawyer advised me to avoid doing anything that obviously copied Star Wars. This was disappointing, as I’'m a big fan who sees Star Wars parodies all the time; but I’m also a big fan of staying out of court. So we went Star Warsy instead. Nevertheless, fans will get what I’m talking about. The great Greg LaRocque—who has drawn everything from the Flash to Spider-Man—thought this sounded like fun, and agreed to do the art. The first page begins characteristically with “A long time ago…” In addition to the mashup with Hamlet, we find a gag based on the “moose bite” sequence at the end of Monty Python and the Holy Grail (1975). My conclusion may sound like an echo from earlier in the same film where the animator suffers a fatal heart attack, but that final footnote is actually an exact quote from Aleister Crowley’s Sword of Song (1904; rpt. 1906), where he did this exact same ridiculous gag some seventy years before the Pythons. In volume II of The Workd of Aleister Crowley (1906), the essay “The Excluded Middle" was among those appended to The Sword of Song (1904). 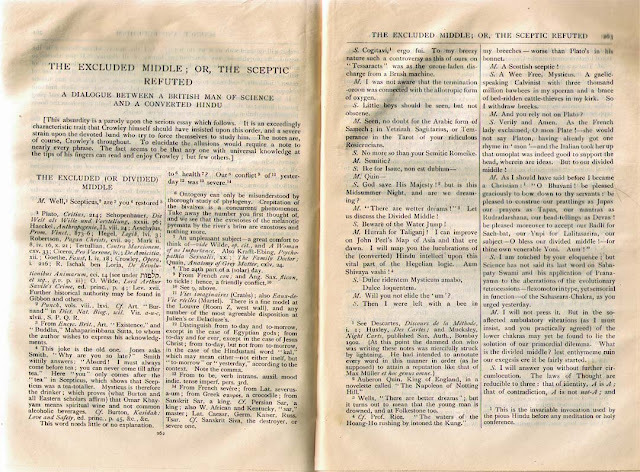 The first footnote on the second page contains the gag quoted in Hamlet Special Edition. On Page two, that first panel recalls the first glimpse we saw of Finn in the Force Awakens teaser. In the second panel, to go with the line “Not a mouse stirring” I asked for something in the background resembling a mouse droid …which Greg supplied albeit in ironically oversized form! Horatio is supposed to remind us of the actor who originally portrayed Jabba the Hut in the deleted scenes from Star Wars, i.e. before he was replaced with CGI. Again, we weren’t going for an exact copy here so much as an approximation. Page three gives us a random lizard with rider, decidedly non-Danish structures in the background, and for no apparent reason a small flying robotic probe. On page four, my idea was to have the first appearance of the ghost resemble the original force ghost of Darth Vader at the end of Return of the Jedi, but we wound up going with something a little more generic just to be safe. We also have a weird critter in the background of panel 3. Thus the “Romans go home” reference acknowledges this edited-out passage. When the ghost reappears in panel two, he’s not quite as dark and unpleasant-appearing but instead resembles the Special Edition force ghost of Hayden Christiansen. The pole-arm in the bottom panel has a blade that kinda-sorta looks like the Rebel emblem (but is also a standard blade design in medieval weaponry). Finally, on page six we see Horatio holding what might be the One True Ring, but it’s also supposed to suggest a Stormtrooper examining a droid part on Tatooine. 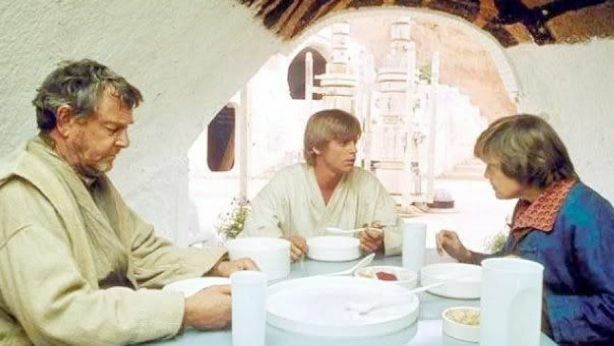 And positions in the last panel of Claudius, Hamlet, and Gertrude is intended to mirror Uncle Owen, Luke, and Aunt Beru in Star Wars. The last panel of Hamlet Special Edition recalls this scene from the original Star Wars (1977). When going to press, I discovered that while my hardcover printer was happy to do a flip-book according to my specs, CreateSpace flat-out refused to do it with the paperback. They said I could not print two books in one, and no amount of insisting that it wasn’t two books would get them to budge. We were faced with a last-second redesign of both the book and cover for the paperback edition. (Naturally this also applied to the eBook, as there’s no way to do a flip-book eBook.) As a result, on the paperback the fake back cover had to appear (mostly) right-side-up rather than flipped. In addition, because the comic book pages followed right-side-up after the end of the novel proper, that required me to include a grayscale version of the cover inside the book itself, It still works, it just wasn’t how I wanted the gag to work. The dilemma was that this paperback reformatting left me with a blank page on the verso of the grayscale cover. Sure, I could have left it blank. Or put “this page intentionally left blank.” That would have been easy. But I don’t do easy. 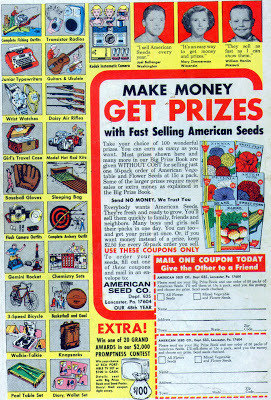 My wife suggested, “Put a fake ad there.” That suggestion sent me to my longboxes of comics, looking at the types of ads that appeared in bronze-age comics. I could have gone with sea monkeys. Or plastic soldiers. But instead I went with the classic bunch-of-crap ad instead. 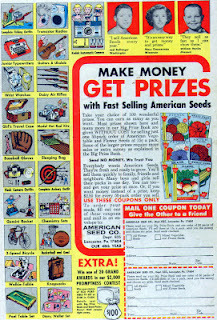 Bronze-age comic book ads, like this one from American Seeds, were the inspiration for the "Hey Kids" ad in Hamlet Special Edition. The next morning I licensed a bunch of retro clip art, dashed off captions for the imaginary products, and within an hour had a last-minute addition that is probably the single funniest page in the entire book. It makes up for the paperbacks not being the flip-book that I originally wanted. Sadly, this page doesn’t appear in the hardcover…so for the 100 of you who splurged, I’m sorry to say you need to get either the paperback or ebook to see this bonus page. Page 230 – 231: Blond villain trope…literally! Page 222: What’s in the box?